« Audiobook Week 2012 – Listen Up! If you’ve spent much time on the internet, you have probably run across Jenny Lawson, aka The Bloggess, at one point or another. She’s known for her picture of Wil Wheaton collating paper, her strange fascination with stuffed animals dressed up in odd clothes, and her openness about battling anxiety and depression. If you’ve only read her blog casually, though, you may find yourself more perplexed than amused by the humor in some of her posts. 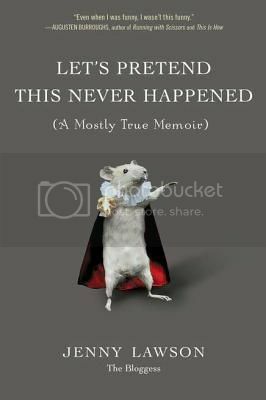 Luckily her new memoir, Let’s Pretend This Never Happened: A Mostly True Memoir works whether you are already a fan of Lawson’s blog or not. In fact, in giving the reader a thorough introduction to who exactly Lawson is and how her mind works, it is a strong possibility that Let’s Pretend This Never Happened will give readers a greater appreciation of what happens on The Bloggess. Take, for example, her obsession with animals dressed up in people clothes. Let’s Pretend This Never Happened moves chronologically through Lawson’s life, and the first major revelation is the fact that her father was a taxidermist. Okay, so she took her father’s passion and has her own quirky take on it, you may think. This love takes on a whole new dimension, though, when you read Lawson’s anecdote about the dead squirrel her father put in a snack box and then used as a puppet to surprise her and her sister. Lawson’s life is memoir-worthy, because, perhaps scarily, the squirrel puppet incident is not unique, nor is it the strangest and most dramatic thing that has ever happened to her. Let’s Pretend This Never Happened is, in short, hilarious. Lawson shows a brilliant ability to be open and vulnerable, while at the same time poking fun at herself at every possible juncture. Her writing is engaging, but her personality is even more so. You will find yourself so wrapped up in Lawson’s life that you won’t want to put the book down, nor will you want it to end. Highly recommended. Be careful listening to the audio! One blogger told me she nearly crashed into a light post because she was laughing so hard while listening. Sounds like I might need to listen to this one! I’m listening to the audio right now, and I’ve spent so much time sitting in my car when I get home that boyfriend has gotten worried. I just don’t want to turn it off. This sounds great! I think I’ll try it next…maybe THIS will break the reading slump! I just ordered this book, and I am really excited that I will be reading it soon. It seems like such a weird memoir, and I love that. This was a great review, and I am so glad that you loved it! I’m in the final bit of this and it’s just hilarious. I love her sense of humor. I’ve only visited her blog a few times, and yes a great sense of humor. I really want to read this book, hoping to win or borrow. Buying books is such a big problem for me….my husband is about to lose his mind…LOL! I listened to the audiobook and it is really hilarious. Glad you enjoyed it too. I knew basically nothing about the author before I started listening but I really liked her sense of humor. And you’re right it is a read/listen that you won’t want to put down! Definitely need to get my hands on this one, and I love listening to humorous memoirs on audio! Jenny reading it aloud makes it all the better. I’m in the middle of Tina Fey’s Bossypants on audio and loving it . . . will be adding this one to the queue. I need to get this ASAP. I love her blog and her warped sense of humor.